Abbey United carried on throughout the Second World War, as Andrew Bennett's comprehensive record shows. That stance soon softened, and an ad hoc series of leagues and cups developed, regionalised due to petrol rationing. The turnover of players was rapid as men joined up and moved around with their units, and many famous names appeared as guests for clubs and services teams: Dixie Dean and Alex James were just two of the stars who appeared on Abbey United’s humble turf during the war years. Football matches were encouraged as a way of maintaining morale but wartime games tend not to be included in historical playing statistics. The Abbey’s matches, many of them against Forces XIs, were reported in the local press but names of players and teams were not always allowed to be revealed as the Government did not want the enemy to know of the large number of RAF units in the Cambridge area. The club had to keep the ground open during the war: if it was not used regularly it could have been requisitioned for military use. Most of the club’s committee and all of its players were called up in time, but secretary/treasurer Frank Pettit, in a reserved occupation – general foreman of Watts’ Timber Yard – stayed put. Pettit kept the club going virtually single-handedly, acting as chairman, secretary and treasurer and helped by such people as Herbert Crane, whose son Russell was a promising footballer. He arranged friendly matches with Army and RAF units, relying on locally posted servicemen to make up his own team, or hosted games between forces sides, sometimes acting as referee. On one occasion he fielded a side that included seven Aston Villa players when their Birmingham battalion was stationed in Barnwell Road. Just before the declaration of hostilities, Cambridge Town had begun their Spartan League campaign at Hoxton Manor with Abbey’s Reg Kimberley at right back, partnered by Harry Bullen, who was to figure significantly in Abbey’s history some years later. With his son also playing for the Town, Harvey Cornwell turned out at right back for their Reserves. ​He was sometimes joined by Freddie Mansfield, who served his country in a UK-based anti-aircraft regiment because of the numerous injuries his fearless play had attracted; when Mansfield made to re-sign for United after the war, the club secretary branded him a ‘traitor’ for playing for the Town and scuppered the deal by threatening to resign, although he did return to the Abbey a few years later to coach the ‘A’ team, and in later life became a regular spectator at the ground, right up to his death at the age of 91 in 2004. Town’s first team included another Fred Mansfield, a right back who had just returned to the club from Brentford. The first competitions the Abbey signed up for were the Cottenham and Willingham Nursing Cups. A good number of the previous season’s players including the redoubtable Wally Wilson were still available, and they started their season by thrashing Willingham 5-0 in the former competition. Two-goal new boy Don Hall was the star of the show. Football remained as competitive as ever. 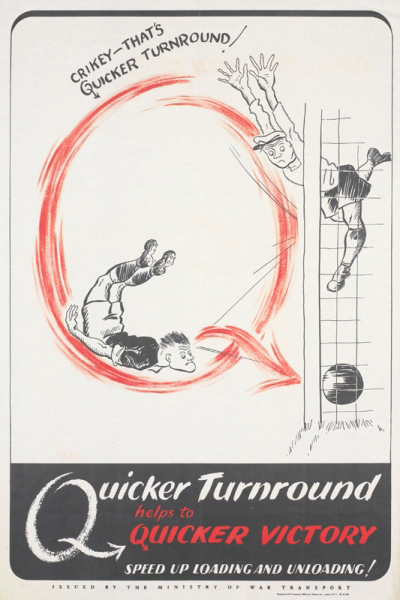 In an end-to-end Willingham Cup game against Orwell, the visitors’ goalkeeper, Bullen, was hospitalised with a broken finger after half an hour with the score at 3-3; ‘when Sanderson increased the tally to five, Orwell made an abortive appeal for offside and, in a fit of pique, one of their defenders attempted to kick the ball into Fen Ditton!’ The final score was 6-4. Abbey United's Creake Charity Shield-winning team of 1938/39, some of whose players turned out during the war. Back, from left, Herbert Smart, Reg Kimberley. Arthur 'Buck' Arnold, Ron Sanderson, Ernie Caston, Reg Wilson; front, Fred Mansfield, Monty Bull, Wally Wilson, Bob Brown, Joe Richardson, Jim Langford. 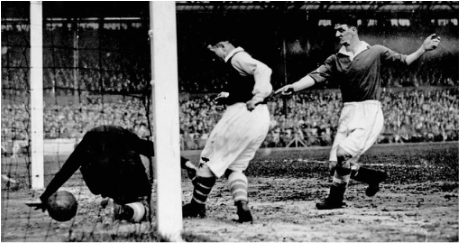 Alex James, seen here scoring for Arsenal, played on the Abbey turf during the war years. The Cambs FA organised a Cambs Emergency League (split into two regional sections) for 1939/40, with Abbey United placed in Section A alongside ten other clubs, although of those Swavesey, University Press and Willingham withdrew during the season due to difficulties in raising a team. Their first two games ended in unexpected defeats to Landbeach and Camden, but the report for the latter game noted: ‘The Abbey policy, now that they find it impossible to turn out two teams, is to make changes in the side with a view to giving all players a game.’ Victories followed in November over Willingham and the Press and progress was made in the cups with wins over Littleport and Bottisham, but the weather meant Christmas Day and Boxing Day derbies against Histon were postponed. When the freeze lifted, United had to cancel a match at PO Telephones as they were unable to raise a team, and they played only their second game of the year on March 2 against Cambridge Town Reserves, who fielded a familiar face: ‘The Reserves put out a young side but included the veteran Harvey Cornwell, who was one of the outstanding men on the field, and incidentally scored the best goal of the match.’ United overcame the youngsters and the 43-year-old by six goals to three. There was a minute’s silence before the game to mark the death on February 13 of Henry Clement Francis, who had served as the club’s president for over 20 years; he was 83. In gifting the Abbey its own ground, he had laid the foundation for everything the club would go on to achieve in years to come. In mid-April the first German bombs were aimed at Cambridge but fell short, landing in sugar beet fields on the outskirts of town. But Cambridge was to sustain the first fatal raid on the eastern region in June, when 14 people were killed by bombs on Vicarage Terrace, off Sturton Street. This was where the Smart family including future chairman Reg lived, although they escaped unscathed. United lost to Camden in the Cottenham Nursing Cup semi-final and the Willingham equivalent was never completed. The Abbey also failed to complete their Emergency League programme of 14 games, as did every other club, due as much to the cold winter as the demands of the war effort, and the league was closed on May 11. Camden were champions with 19 points from 11 games and Abbey finished fifth with five wins and four defeats. There would be no more organised league football for the Wasps until 1942; there were more pressing matters to attend to. The Cambs Emergency League was not continued, leaving United with no competition in which to play. Larger, wealthier clubs competed in the East Anglian League, under-18s had the Cambs Minor FA League, and the Ely & District League carried on, but Abbey confined themselves to friendlies, largely against forces sides. Of 20 matches played that season, 11 were against RAF XIs: the Air Force was described as ‘co-partners of their ground’. It was a useful alliance, ensuring that Newmarket Road remained in use as a football venue. Familiar faces such as Wally Wilson, Ernie Caston and new captain Monty Bull remained in club colours, and Abbey welcomed back Harvey Cornwell and Harvey Jr, plus Sid Johnson. ​The Abbey’s best early performance was a 5-1 defeat of Town’s Reserves in October, a month in which the Football Association declared its opposition to an unofficial ‘spotter system’ adopted at some matches when an alert was sounded: having someone look out for enemy aircraft while the game continued. The FA announced: ‘The Ministry of Home Defence has informed us that they do not feel justified in accepting the risk of bombs falling on a crowd of spectators in the open, and feel bound, therefore, to request this Association to continue for the present the practice of suspending matches when a warning is received.’ War or no war, the English loved their football. 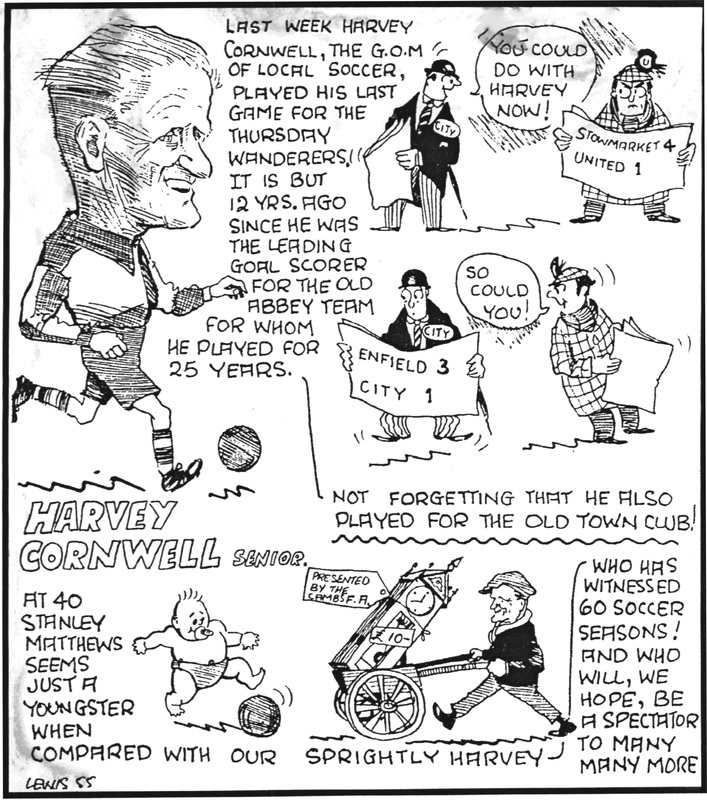 Left, how the Cambridge Daily News portrayed Harvey Cornwell when he played his last game for Thursday Wanderers in 1955 at the age of 60. A semi-regular throughout the war, he was 50 when he played his last game for Abbey United in March 1946. 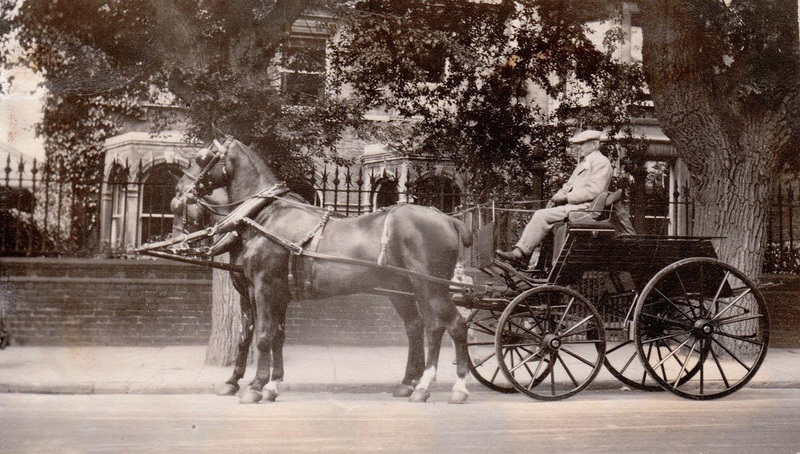 Above, club president Henry Clement Francis outside his home, Burleigh House, Newmarket Road, in the late 1930s. He died in 1940. 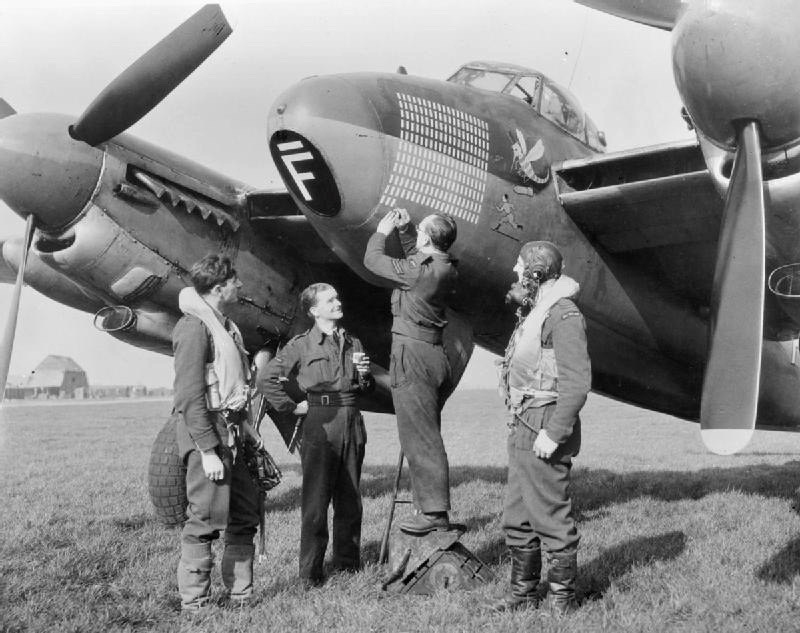 Below, members of 'C' Flight, No 105 Squadron RAF at Bourn with a De Havilland Mosquito. Might some of these airmen have been among the many who played at Newmarket Road during World War II? Frank Pettit, who kept Abbey United alive throughout the war almost single-handedly. Photo: Cambridge Evening News. There was no traditional Boxing Day football because that day’s bank holiday status was temporarily revoked, which meant that Christmas Day was the only day off in England and Wales and New Year’s Day was the only day of rest for the Scots. A weakened United side was trounced 9-0 by Town’s Reserves at Milton Road on the Saturday between those dates. The year of 1941 was the worst of the war for bombing raids on Cambridge. Two hundred incendiaries fell on the Hyde Park Corner area on the night of January 16; two cottages were hit, with two fatalities, when Mill Road bridge was attacked on the afternoon of January 30; on February 24 a three-phase raid on Cherry Hinton Road, Grantchester and Hills Road caused 11 deaths; and hundreds of incendiary bombs showered the Trumpington Road area on May 9, with 50 houses receiving direct hits. 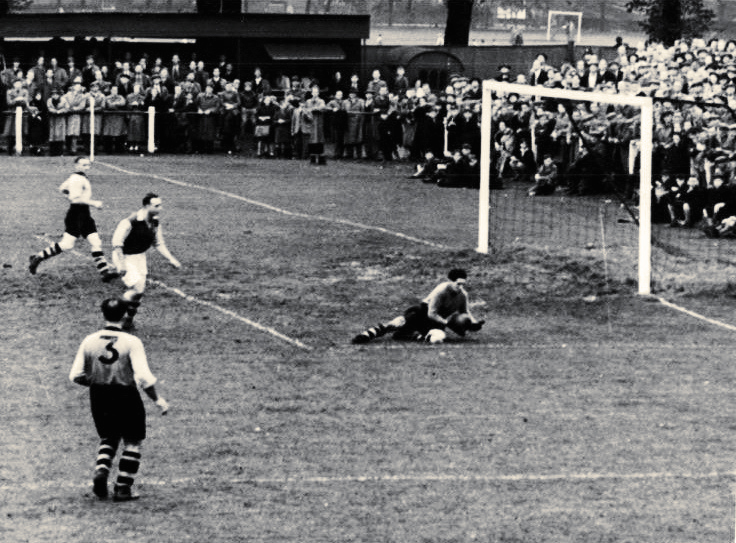 RAF and Army sides regularly contained professional players who were serving their country, and Newmarket Road was graced by the great Alex James, of Arsenal and Scotland, when he turned out for Hallen’s in a 2-1 win over Marshall on May 16. The newspaper reflected: ‘In pre-war days Abbey could not have dared to hope to give such a combination a fight, but in present circumstances, they are confident of putting up a good show.’ The country was putting up a pretty good show against the enemy. The people, and the Abbey, kept calm and carried on. Abbey United played three friendlies against teams from the nearby Marshall Group works and airfield during the war. Marshall established a flying training school for the RAF Volunteer Reserve in 1938, and trained over 600 RAF pilots before the start of the Battle of Britain in July 1940. Some are pictured here. 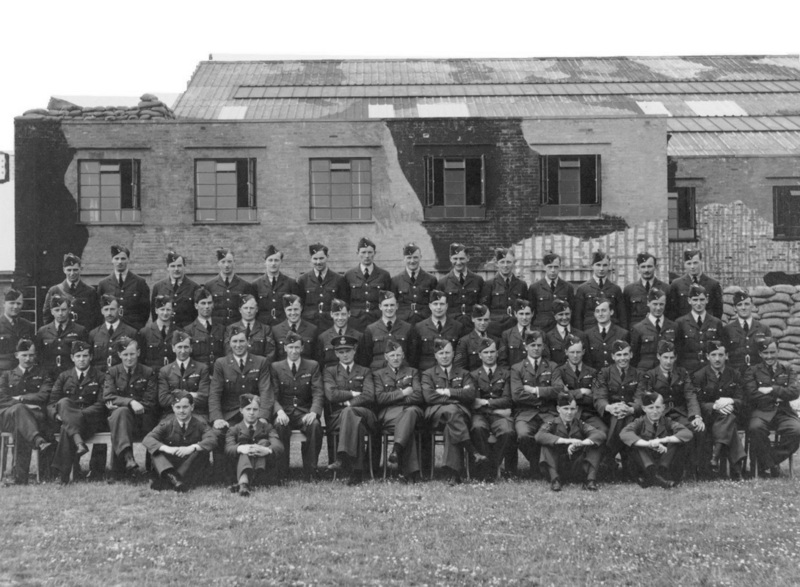 By the end of the war the company had trained more than 20,000 aircrew including pilots, observers and flying instructors; its training scheme was adopted by the RAF in 1941 and continues to this day. Marshall also modified and repaired more than 5,000 aircraft, including frontline operational types like the Mosquito, Spitfire, Hurricane and Wellington. The workforce was expanded during the war to around 3,000, including many women. Above, Russell Crane portrayed by caricaturist Lewis in the early 1950s. Right, Albert George remembered by Colin Proctor. Both played as teenagers during the war years. The core of the United squad remained together as the club continued to play friendlies the following season, almost exclusively against representative Services sides. In late August ten bombs hit two houses in Great Eastern Street, off Mill Road, with two fatalities, while the following month a stick of high explosives landed at the top of Castle Hill, damaging telephone wires and pipes but causing no casualties. 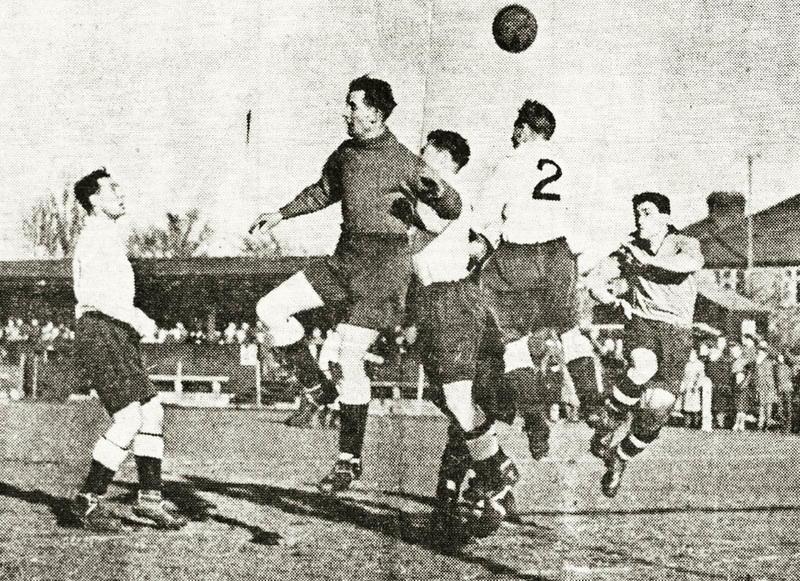 ​​Abbey’s campaign opened on September 13 with a 4-2 defeat of an RAF XI, their half-back line combining the comforting figures of the ageless Harvey Cornwell and Wally Wilson, while on the left wing a debut was given to 15-year-old Russell Crane, whose father Herbert was involved behind the scenes at the club. Crane, who was to become leading scorer for the Abbey in the United Counties League just six seasons later, was described as ‘a grand shot’. The team lacked a goalkeeper so tried out former Cambridge Town centre forward Pauley, who did well, while T Newman from Bottisham accompanied Monty Bull at full back, but it was Wilson who was hailed as the outstanding defender. A dramatic game the following week against RAF (MU), Abbey’s co-tenants, saw the debut of two more young talents: left half B Bull and 16-year-old forward Albert George, while Cyril Haylock was persuaded to make a comeback after being retired for four years. Cornwell and Monty Bull were taken to hospital to have cuts stitched, but the airmen provided substitutes to make up the numbers and United ran out 5-1 victors. ​Seven days later Cambridge Town Reserves arrived with only six players, so United loaned them three of the previous season’s regulars – Northrop, S Wilson and Brown – and played ten against nine. New keeper F Read was to remain in place all season. Teenagers Crane and George both put goals past Town keeper Tony Gallego in the hosts’ 3-1 win, the diminutive but speedy Crane’s wing battle with full back Marsh being a highlight. ​Pilsworth increased his tally to ten goals in three weeks with another trio against the RAF on Newnham’s Lammas Land (4-0) and with the temporary withdrawal of Wilson, W Mynott took over the right half position alongside Cornwell and the younger Bull. With Newman, Monty Bull and Read behind them, Abbey’s back line took on a settled look as United played almost every Saturday. ​It seemed that United were building a useful team. After a 2-0 win over RAF (MU), one of the strongest sides in the district, the News raved: ‘Abbey won on their merit. The members of the team are all local men and as several of them are still in their teens they have plenty of time to develop. The secret of their success is that they play together as a team.’ The newly reformed Cambridge Loco were hammered 9-1 by Abbey’s ‘nippy forwards’, with three for Pilsworth and four for S Seymour. A month later Abbey enjoyed an entertaining 3-3 draw against RAF (MU), and wound up a stop-start season since the New Year with a 4-3 loss to the same outfit on April 11, putting up a tremendous fight against an XI that included professionals such as Morgan of Cardiff City and Smith of Tottenham Hotspur. It seemed Abbey United were not just surviving but flourishing in footballing terms, even if their existence was hand-to-mouth off the field. 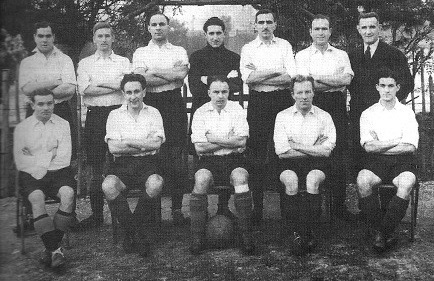 The club lost money gradually throughout the war, much of it going to the government in Ground Tax, and they were propped up financially by Harvey Cornwell’s second-hand furniture business and Lew Sylvester, an ice cream vendor from Mill Road who had been a Cambs League referee in the 30s. At the end of July 1942, Cambridge suffered its first bombing raid in ten months: a low-flying raider unleashed a load on the Bridge Street-Sidney Street area, causing three fatalities and seven injuries. 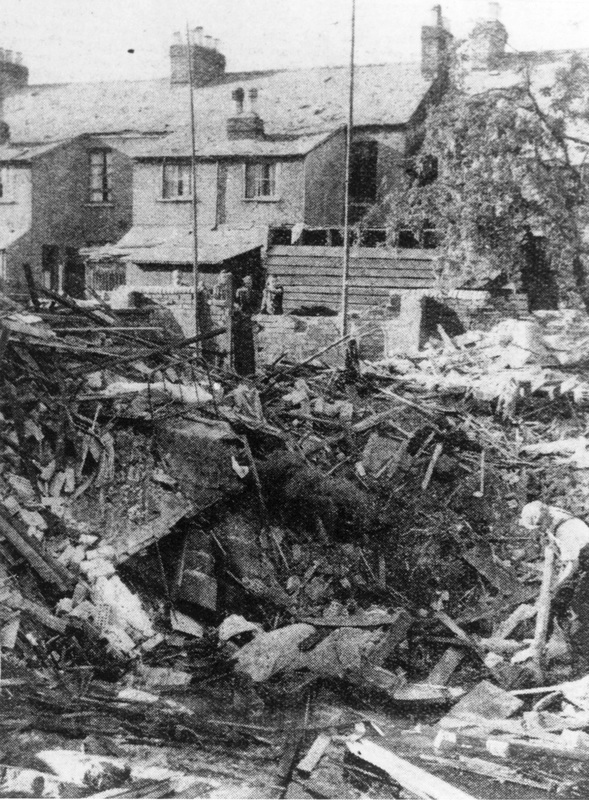 Chesterton and the Stourbridge Common area were hit by around 700 bombs and incendiaries on August 7, but damage and casualties were light. Abbey lost top scorer Pilsworth when he received his call-up papers, but resumed training in September and decided to join the East Anglian Emergency League, which included various letter-coded RAF sides, BP (Blue Pencil) Sports, Royal Engineers and, most excitingly, Cambridge Town. The press enthused that their ‘meetings with the Town will undoubtedly draw big crowds’. The Wasps obtained a regular keeper, Stan ‘Pop’ Ballard, who had played a handful of times in 1940/41, and started the season with a 2-0 friendly win over a strong RAF (MU) side thanks to their youthful front men: ‘All Abbey’s forwards were fast and clever and the three inside men, Crane, Seymour and George, were always ready to try a first-time shot.’ Seymour fired four goals in a 7-1 demolition of the Royal Artillery – Cornwell and Wilson were singled out for praise – then a robust RASC XI was beaten 2-1 before Abbey’s first East Anglian League game at home to RAF ‘W’ on October 10. The referee failed to arrive, so the airmen’s PT instructor, Cpl Johnson, took charge. Abbey raced into a three-goal lead with two from Seymour and one from George, and although the RAF pulled two back before half-time, a Crane goal after the break sealed a 4-2 victory. 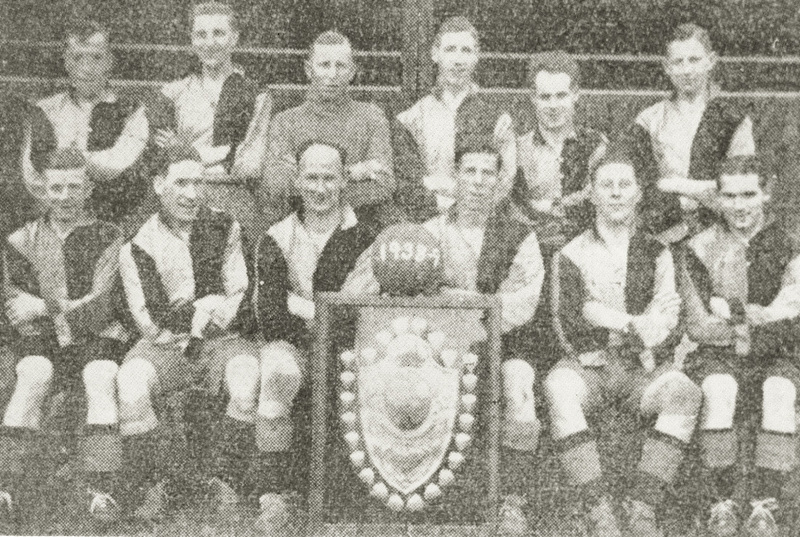 Cambridge Town in 1946/47, with former and future U's Tony Gallego centre, back row, Joe Gallego front right and Harry Bullen second from right, back. Wartime games between Abbey United and the Town were keenly contested. Photo: The Lilywhite: The Online Encyclopaedia of Cambridge City Football Club. United just could not stop scoring goals, with Crane now playing at inside left and Ron Sanderson and B Bull stationed wide. They beat RASC 7-2, thrashed the Civil Service 10-2 at Grange Road, then beat an AA XI (nothing to do with motoring or alcohol) 5-0 with a George hat-trick, despite playing one man short during the first half and with an outfield player, Peck, in goal. The Abbey were rivalling Cambridge Town in terms of entertainment. In early November they took on an Army XI and, starting with just nine men, found themselves 4-1 down at half-time. But Reg Marsh, who was resting an injured leg and was watching the match, entered the fray in borrowed clothes and played ‘the game of his life’ as United won an amazing contest 6-5, Seymour scoring the winner with his fifth goal just before the end. 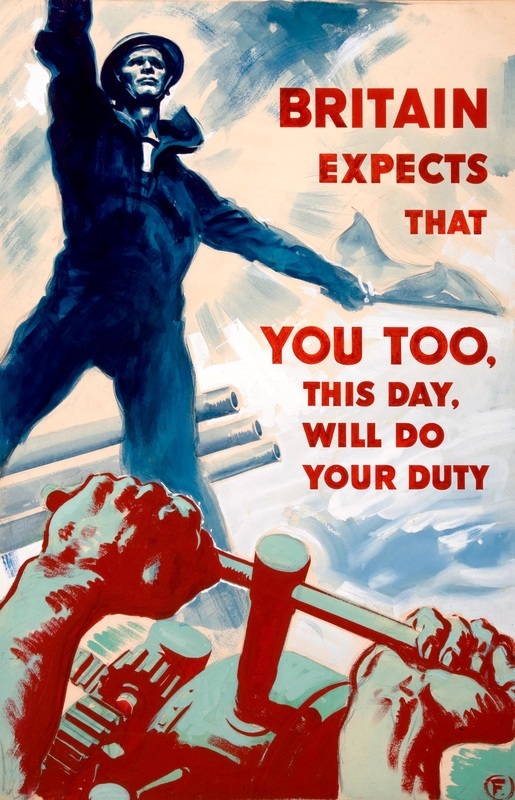 A Ministry of Information poster on the part played by industrial workers. Many Abbey players were called up to the Forces, and it was often a struggle to raise a full team. Photo: National Archives. 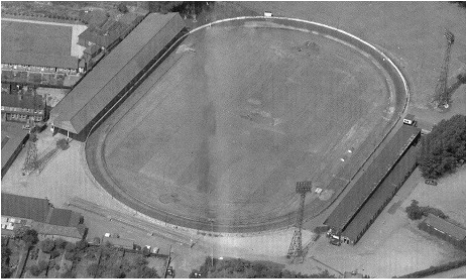 Cambridge City's Milton Road ground, seen in a later era, was the scene of many Town v United derbies. Photo: The Lilywhite: The Online Encyclopaedia of Cambridge City Football Club. Anticipation was keen for the local league derby between Abbey and Cambridge Town at Milton Road on February 13, which was attended by close on a thousand spectators. The powerful hosts won 5-1, but the underdog Wasps put up a spirited fight, particularly 16-year-old Crane and veteran Cornwell. The teams met again at the same venue a fortnight later in the third round of the East Anglian Cup, and a stronger home side with two men, Fred Mansfield and George Dean, home on leave, overcame plucky resistance with an 8-1 victory despite the best efforts of Cornwell and Wilson. Albert George played his last game before joining the Navy, as he approached his 18th birthday, in a 3-0 defeat to the Civil Service in early February and right back Newman returned on leave to turn out in a 4-2 league win at leaders RAF ‘W’, which permitted Cambridge Town to take over at the top of the table. At the end of March, the Town visited Newmarket Road for the first time in the return league meeting, and they were too strong for the hosts, running out 3-0 winners despite the presence of the on-leave younger Bull for Abbey. Russell Crane scored four times, all from crosses provided by ex-Town wide man Sid High, in a 5-1 friendly win over Bourn, and Albert George made a return for a 4-0 league win at RAF ‘O’ – ‘Pop’ Ballard’s last match before joining up. This was a season of departures and returns, and it must have been an emotional time as colleagues left to face an uncertain fate. Pilsworth reappeared in a friendly against the Army that marked the debut in goal of 18-year-old Antonio ‘Tony’ Gallego, who had played against the Abbey for Town Reserves the previous season. 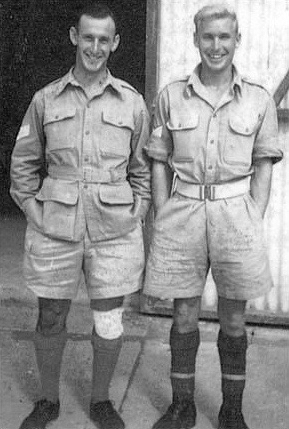 Tony and his elder brother, Jose (anglicised to Joe) had come to England in 1937 from Spain as refugees of the Civil War. The Gallegos’ socialist father was away fighting for the Republicans (they later learned he had been killed at Guernica, but never retrieved his body) and when their house was destroyed, their mother Luisa placed her five eldest children in an orphanage in Bilbao while she found shelter with her baby girl, who fell ill and died. The children were taken to a recommissioned cruise liner, La Habana, and endured a rough crossing to England. Prime Minster Stanley Baldwin initially refused to accept them, citing a non-interventionist treaty and adding ‘the climate wouldn’t suit them’, until a public campaign forced him to change his mind. They did not see their mother for ten years: having lived in France during the war, Mrs Gallego tracked the children down through the Red Cross and sailed to England via Portugal. The family was finally reunited in a rented home in Cambridge in 1947. 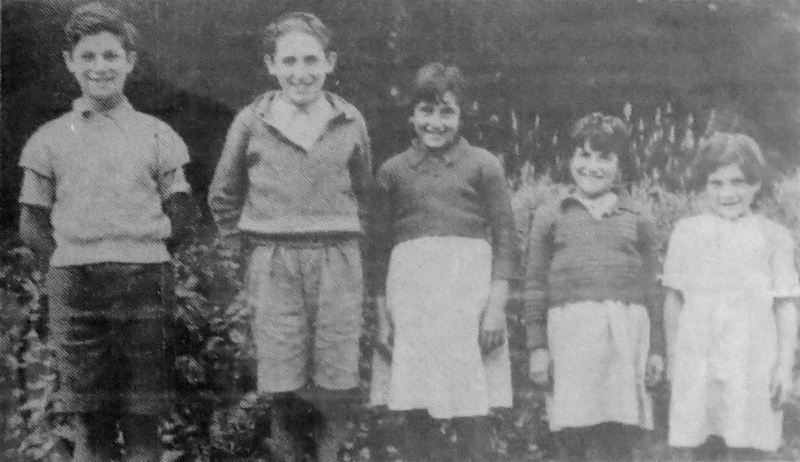 The Gallego children in 1937, refugees from the Spanish Civil War. From left: José, Antonio, Vicky, Geno and Maria. Right, Tony Gallego saves a low shot in an unknown match. Below, Joe Gallego (right) watches as Jack Thomas is sandwiched by a Tottenham Hotspur A defender and the goalkeeper, during a 1950s match. Photo: Cambridge Daily News. No definitive league table was published, but Abbey had given a good account of themselves with a young side (plus two venerable 40-somethings) and much upheaval. They were still carrying on. Russell Crane was the next departure, joining the Navy when he turned 17. The remaining United players began training at six o’clock every evening from September 4, and secretary Frank Pettit told the press that anyone who turned up would be given a trial. The Abbey would be pleased to arrange friendlies, he added. They entered the East Anglian League again; it had expanded from seven to eight entrants with another ten in the Southern section. Former United man Sam Cornwell made his Football League North debut for Coventry City on September 18 against Walsall. His father, the venerable Harvey, remained an Abbey regular as he entered his 48th year. This was to be a tumultuous season personnel wise as the war intensified, and 30 new faces came and went from the Wasps team, many of them for just one game and many of them servicemen. Somehow, three men remained ever present throughout the season: right winger Sid High, left back J Farrant and top scorer T Taylor, while Cornwell and Tony Gallego missed just one league match each. Wally Wilson only appeared twice, though, as he was not immortal like Harvey; it was the final season for an Abbey legend who had graced the club since it had started playing competitive football in 1921, making more than 300 appearances over 24 seasons. United, with the luxury of Crane and Albert George in the team, started well with a 4-0 defeat of RAF (MU). Their first league match at home to Bourn brought an equally emphatic 5-1 victory, with a hat-trick from Brown. The first Cambridge derby came early in the form of a league clash with the Town at Milton Road, and Abbey took a shock lead via the diminutive but pacy Taylor, but Joe Gallego enjoyed the pleasure of scoring past his brother to level the scores by half-time. The second half was equally keenly contested, but Town found the net regularly and a late second from Taylor could only make the final score 4-2; another honourable defeat. Cornwell switched sides for United’s next friendly, turning out for an AA XI, but the main topic of conversation was Tony Gallego, who kept goal for the first half then swapped places with right back Talbot and fired the winning goal of a 3-2 win, finishing coolly after dribbling past ‘most of the opposition’. 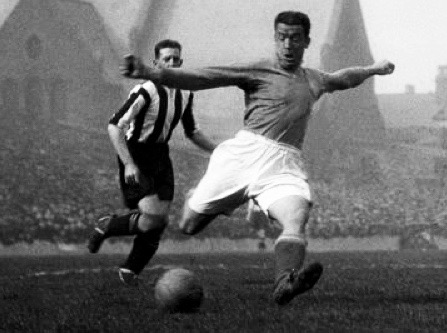 A large crowd attended Abbey’s next league match against a Lancers XI, mainly due to the presence in the army side of Everton and England goal machine Dixie Dean. Dean ‘played a quiet game and showed his class with some well placed touches’, but his colleagues were too good for the Wasps and took away a 3-0 win. United fell at the first hurdle of the East Anglian Cup, losing 3-0 at home to Royal Engineers; the hosts were ‘not able to get past a defence who were never slow in using their weight.’ Then came the return contest, at Milton Road, with the Dean-less Lancers. With six first-teamers missing, Abbey had to borrow a half back from their opponents, who also consented to their fielding the Town’s Udal up front, accompanied by a Spaniard named Moreno. The scratch side was no match for the powerful hosts and lost 4-1, although ‘Harvey Cornwell dropped back and showed his younger colleagues how it should be done. His head was always in evidence.’ Sadly, the Lancers were forced to withdraw from the league in early December, to be replaced by Newmarket Town. The following weekend a therapeutic 10-3 thrashing of an AA XI saw the Abbey back to winning ways, racing to an 8-0 lead by half-time despite having outfield player Lucas in goal in place of the injured Gallego. ‘Pop’ Ballard returned to keep goal at RAF ‘W’. He probably wished he hadn’t as his side subsided to an 8-2 pounding, with the airmen described as a ‘hot handful’. On December 11 Abbey travelled to Chesterton to take on the Town in a friendly, and came away with a stunning 7-2 victory. True, Town were missing six regulars but that should not detract from a fine team performance, which included a hat-trick from Taylor. The last game before Christmas was a classic game of two halves against an RASC XI, a 1-1 half-time score turning into a 10-1 hammering by the final whistle. The United team included two airmen, right back Ellis and centre forward Harris, whose brother played in the same position for Millwall; he scored twice, as did an on-leave Crane. The league campaign resumed on January 8, but United were still struggling to find players and borrowed two soldiers, Cpl Robb and Sgt Sutherland, and a schoolboy, R Blackwell, to make up the numbers at home to RAF ‘W’; Harris had been invited to play for his brother’s team against Charlton Athletic in Football League South. At least they could welcome back Wally Wilson for the first time that season, but he could not save them from a narrow 2-1 loss. Postponements meant that Abbey had to wait three weeks to play again, in a 4-4 league draw at Madingley Road Sports, and Pilsworth returned to steer them to a 4-2 win over Newmarket with a couple of goals, the visitors fielding seven players under the age of 18. The demands of the call-up meant a stream of young talent was needed. Dixie Dean strikes. The Everton and England great helped to attract a large crowd to Newmarket Road when he played for a Lancers XI on Saturday, 16 October 1943. The Ministry of War Transport used the popularity of football to encourage employees to unload their vehicles more efficiently. Photo: Imperial War Museum. The turnover in players accelerated towards the end of the season. Three new faces appeared in a 1-1 draw with RAF ‘L’ and, after a 5-0 defeat to the Royal Engineers, five more debutants started at Newmarket. Two of them, Liddington and Murphy, scored in the team’s 3-2 victory but none of the five were seen in Abbey colours again. The war was felt most keenly at Newmarket Road on April 22 when, before a friendly with RAF (MU), the players stood in silence to remember Len Johnson, who had been killed in action. 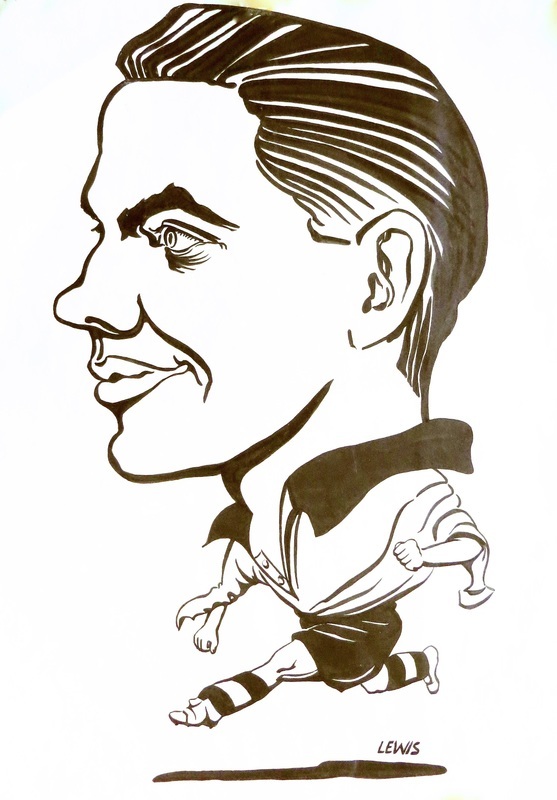 The reliable left winger had made more than 100 appearances for the club since making his debut against Royston Town on 9 September 1933. United’s reliance on servicemen was underlined by the presence of five players (Connolly, Hayward, Ellis, Cross and Brunton) in the RAF team who turned out for the Abbey that season, and two members of the Abbey side, Eaton and Flintham, were airmen playing with the RAF’s consent. Connolly had served United on the left wing but was now playing in goal. Brown was back on leave to boost the hosts, but they succumbed 2-1 in an entertaining match. Another member of the RAF side, Andrews, lined up for the Abbey the following week in a remarkable game against the Royal Engineers. The Wasps took a 3-0 lead inside the first 20 minutes – including a brace from leading scorer Taylor – and led 4-1, but were pulled back to 4-3 by half-time and eventually lost 5-4, Harris denied an equaliser by the bar in the closing minutes. They rounded off an eventful campaign by disposing of Bourn 7-2. They had not completed their league fixtures, but tables were not a priority in those dramatic times. United had made it through another season, short of money and short of players, but still holding their own in local footballing circles. That was a triumph in itself. In 1944 Herbie Spicer, a railway engine driver from Ditton Fields, decided he wanted to help the club out financially and asked secretary Frank Pettit to gather all the money the club had. 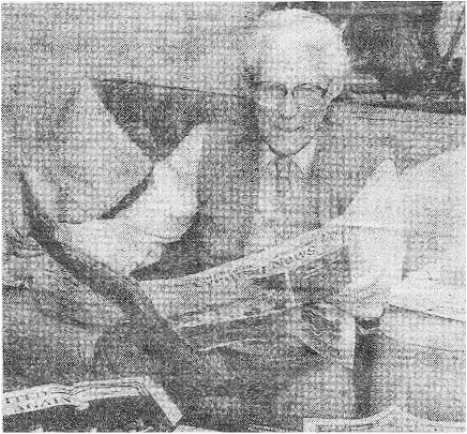 He used the resulting £38 to hire a band and hold a dance at the Beaconsfield Hall in Gwydir Street. The evening yielded a profit of £80 and other similar functions helped the club to tick over until a semblance of normality was restored, bringing in some £50-60 every six months. Mr Spicer’s brainwave had been a gamble that, if it had backfired, could have finished the club, but instead allowed it to come through the war relatively unscathed. The 1944/45 season was a difficult time to be running an amateur football club, the pool of available players dwindling as the war neared its climax. Abbey opened the season with a trial match on September 2 that they threw open to all and sundry, clearly not expecting queues around the block. They were without a permanent goalkeeper for a start, Tony Gallego having decided to rejoin his brother at Cambridge Town. The club, having decided to enter the East Anglian League again, were one of only six local clubs in the Cambs section, against 16 from Essex. In a friendly against RAF (MU) they gave a run-out to Police goalkeeper PC Douglas and Bourn’s centre half, A Green, and tried out five recommended players in another warm-up against Youth Sports Club. Their chosen keeper failed to show, so Harvey Cornwell, now 49, took over in goal and did well as his team won 4-1. The team that took on Cambridge Town in the season’s first league match contained ten men who had played at least once for the club before, many drawn from the RAF. Full back Ellis was playing in goal but they put up a spirited fight, losing 1-0 to a goal by Freddie Barnard. The club came to an agreement with the RAF – already in place informally – that the airmen’s players would be made available to assist the Abbey when they were not required for their own matches or service. It would probably be no exaggeration to say that were it not for the RAF’s help, United would have had to stop competing altogether until the end of the war. A side bolstered by airmen thrashed ten-man Madingley Road Sports 6-0 in the second league match, Harris claiming a hat-trick. The report recorded that forwards ‘Eaton, Harris and Witt played well, the combination between these players being a treat to watch’. The RAF men were not available the following week and, despite the return of George and Crane on leave, they were no match for Histon’s more settled side and succumbed 4-0. A Briton’s mind rarely strayed far from football. 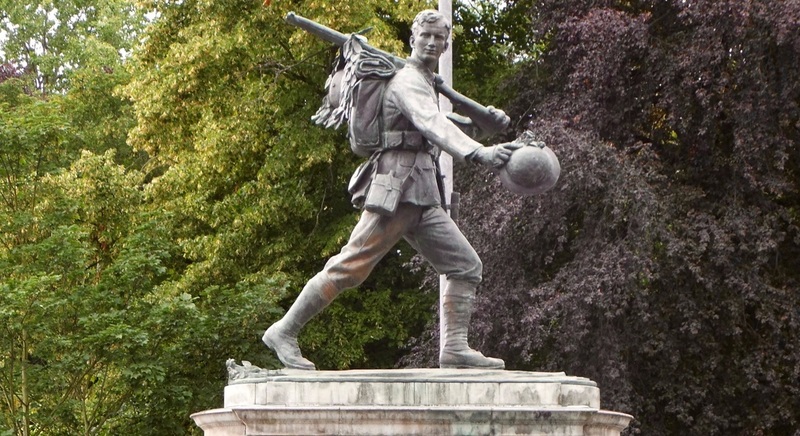 In late October, Trooper J Brown, originally of Magdalene Street, Cambridge, and now of the 11th Army Division, recounted the story of a match between his squadron and a Belgian village team that was played very close to the front line and the German frontier. ‘The Belgians went to a great deal of trouble erecting posts and marking out the pitch which, apart from a few fairly deep tank tracks, was quite playable,’ he wrote. ‘Within the first five minutes the British team scored and everything looked set for a comfortable victory. Then the ominous whine of shell was heard. With one accord everyone went flat on their faces. Jerry evidently thought he ought to have a share in the game for of the eight he sent over, two were offside, one “off the island”, and one smack between the goal posts – our goal too!’ The game had to be abandoned owing to the shell holes, reported Trooper Brown. Football was never far from a soldier's thoughts. 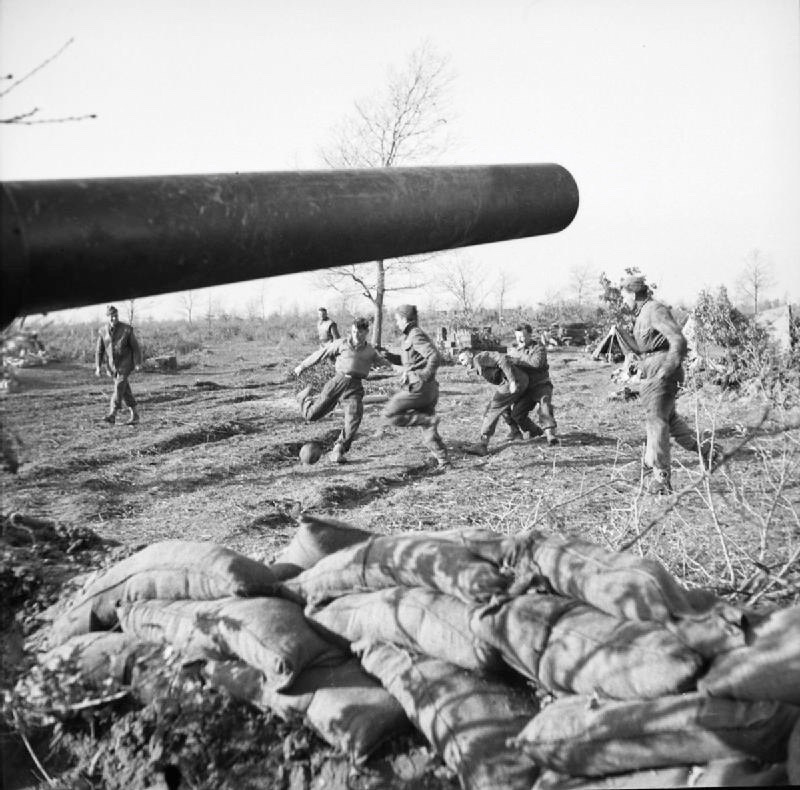 Here, gunners of 111 Medium Battery, 80th (Scottish Horse) Medium Regiment, Royal Artillery, play near their guns in the Anzio area of Italy – where Wilf Mannion served. Photo: Imperial War Museum. Madingley Road, unable to carry on, withdrew from the league in November. Abbey United FC held its annual meeting at the Globe Inn on Newmarket Road and was pleased to report a slightly increased balance in hand. The secretary thanked the players for rallying round in the past season and also thanked the MU for their loan of players. The committee was re-elected en bloc, including president Walter Maclaren Francis, vice-president RJ Wadsworth and treasurer Frank Pettit. The team was defeated 3-2 in its return match at Histon, Ellis missing a penalty and the winning strike coming in the form of an own goal by Cornwell. A new goalkeeper by the appropriate name of A Stops gave a good account of himself. A defeat at RAF ‘W’ followed, then came the return derby with Cambridge Town at Milton Road. A team including four debutants, including yet another goalkeeper, Dedman from the RAF, gave a good account of itself against a host side containing both Gallego brothers, but was defeated 2-1. A friendly at Town brought a 4-0 defeat for a team showing eight changes from the previous week, and Harvey’s task was brought into stark relief. Another meeting was called for January 8 with the message ‘it is important that there should be a good attendance’, but the club still carried on. Games were few and far between, though, as the conflict in Europe approached its endgame in spring 1945. A few friendlies with Marshall’s were advertised, but no match reports found their way into the papers, and the club made appeals for fixtures on February 27 and April 9, while Harvey busied himself playing for the Home Guard against RAF ‘W’ in March. ‘GERMAN SURRENDER’ roared the headline in the Cambridge Daily News of 7 May 1945. Now the rebuilding could begin, for the country, for the town, and for Abbey United. They had survived, thanks to men like Cornwell, Pettit, Sylvester, Spicer and Francis. New challenges awaited. War memorial, Hills Road, Cambridge. Photo: Rept0n1x.